"It was a great pity, she thought, that all the violence of life should fall on the young, before they have acquired any resistance to it." 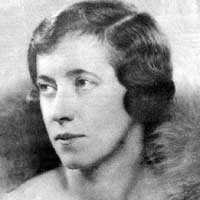 Ever since I began reading about Persephone books in the blogosphere, the same author's name kept popping up over and over: Dorothy Whipple. All the Persephone fans seemed to just love her books. Well, I have taken the plunge, and I am officially on board. She is just wonderful. I just finished my first Whipple, The Priory, and I loved it. It's more than 500 pages, but I could not put it down. It's my fourteenth Persephone book so far and I think it is my favorite. The story is set in the late 1930s, just before the war, and centers around the Marwood family who live in Saunby Priory. The patriarch is Major Marwood, a fiftysomething widower who doesn't want to spend any money keeping the place up since he'd rather spend all his money funding cricket matches. His wife is long dead, his oldest son has escaped to a job in London, and his two daughters, Penelope and Caroline, are in their early twenties and don't do much of anything. There's also an aunt, Veronica, who lives off her brother and spends all her time painting. There are various servants, and a good section of the book is devoted to them as well, a bit like Upstairs, Downstairs or Gosford Park (though much less posh). The Marwood family is shaken up when the Major decides to remarry a local spinster, Anthea. Basically, he wants some unpaid help running the estate and his annual cricket gatherings. This upsets the balance of the family and the plot starts moving along with various romances and love affairs, pregnancies, babies, and scandals. One thing I found interesting about this book is that the focus of the book shifted several times -- at first I thought all the action would be about one character, and then the reader wouldn't hear about this character for a long time. A couple of interesting characters unfortunately seemed to disappear -- perhaps Whipple didn't know how to incorporate them back into the story. He decided to 'hang on for a bit' until things improved. If they ever did. There would probably be a war before long, and then he, with the rest of his generation, would be employable again; as soldiers. When most of them were killed, competition for jobs would be lessened, he thought cynically. The uncertainty of the times affected Nicholas adversely. He had a secret feeling that nothing was worth doing, because nothing would last. He felt he might as well have a good time while he could, because to-morrow, or the day after, the good times would be over. I found the characters in this book engrossing, especially against the backdrop of the war. It was published in 1939 so Whipple couldn't have known how everything would turn out. I think this is my favorite Persephone so far, even better than Miss Pettigrew and Miss Buncle's Book. I just wish it was easier to get on this side of the Atlantic. However, I predict I'll be giving this one out as presents for any appropriate occasion -- my 2011 Secret Santee will probably get a copy of this if he or she doesn't own it already! I didn't buy a copy of this, since I was actually able to get it through Inter Library Loan. But the other neat thing about reading this was that the copy I borrowed came from the University of Central Arkansas and it was a first edition from 1939!! It still had the pocket with the card in it, and the slip with the date stamps showed all the due dates from previous borrowers, starting in December 1939. I don't think anyone checked it out after 1950, which I find sad because I loved it so much. I was sorry to have to return it and I definitely want to buy my own copy. I really wanted to like this book. 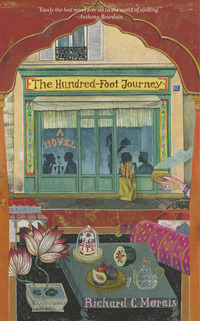 I love food fiction and travelogues, especially anything about France. This book had so much potential, but sadly, it fell short. Let me begin with a quick synopsis: Hassan Haji is a young Muslim boy living in India. His family owns a very successful restaurant, and Hassan spent many happy childhood days in the family’s kitchen with his beloved grandmother. They’re forced to flee the country due to anti-Muslim uprisings. His mother is killed in a devastating attack, so the extended family moves first to England, then finally in Lumiere, a small town in the French Alps. Hassan’s father is determined to start the first Indian restaurant, with young Hassan as the chef. However, this is met with considerable resistance by Madame Mallory, owner of a highly respected traditional French restaurant across the street. Things get ugly, and are finally resolved when Hassan, a culinary genius, is apprenticed to Madam Mallory. 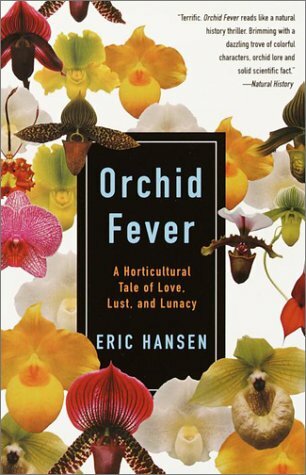 I got an ARC of this book from Amanda at the Zen Leaf – she didn’t care for it much either, but one of her concerns was that she didn’t like food fiction enough to appreciate it properly. 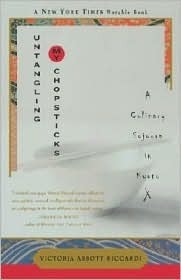 Well, I’ve read lots of food fiction, and I’ve worked as both a professional cook and as a food writer, and I still didn’t like this book. To me, the book’s biggest fault was the lack of character development. Hassan and his family members felt so flat, so one-dimensional. It seems like Morais did more telling about the characters than showing. For example, Hassan tells us that he can’t have a real loving relationship with a woman because of his mother’s death when he was a boy, but we really don’t get any examples. A lot of family members are introduced, but barely described. However, the food, the restaurants, and the location are very realistic. I think the writer spent so much time on these elements that he forgot about the characters and the plot. And the plot – well, it just didn’t make a lot of sense to me. I don’t want to spoil it for anyone who might want to read it, but before Madam Mallory takes Hassan under her wing, she does something terrible, something so bad which I frankly think would be unforgiveable. And the results of this devastating incident are barely mentioned again for the rest of the book! That made absolutely no sense to me. I know as a reader I should suspend disbelief, but there just seemed to be so many plot holes. I think the writer knew a lot about food and wanted to write a food novel, but it’s pretty obvious to me that he’s never worked in a restaurant. Seriously, there is no way anyone with no actual restaurant experience could suddenly become head chef of a restaurant serving more than 100 individual plated meals per night. Hassan is chosen to be the chef because he spent so much time watching his grandmother cook, but I am sorry, this is nothing like cooking multiple different dishes for diners at a restaurant. It isn’t even like cooking for a huge party of 100 people. (Which is why so many people think they could have their own restaurant because they like to cook. And they usually fail). I don’t care if Hassan is a culinary prodigy, this kind of skill takes years to acquire through hard work. That’s why many chefs usually start at the bottom and work their way up, and a lot of them don’t even have certificates or degrees; they do it the old-fashioned way. Besides, I'm really getting tired of the prodigy trope -- Hassan is a brilliant chef because he is just born that way, with the ability to cook and taste and pair foods together unlike anyone else, with little training other than hanging around his grandmother's kitchen and selling street food as a teenager! Hassan's talent was just a little too miraculous for me. 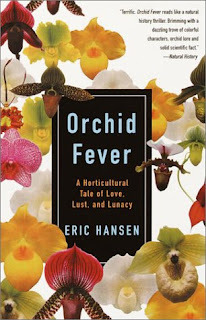 And it's barely worth mentioning that the author throws in a couple of other annoying things, like random comparisons of food to genitalia, which was so out of character to the rest of the book -- is he borrowing from Henry Miller or just trying to show that he's edgy? Also, one scene includes a character with Tourette's syndrome, seemingly for no other purpose than to insert repeated f-words. Again, this had no connection to the rest of the book, and it was so incongruous that it was irritating. This book is really short, less than 250 pages. It had some good ideas but it really seemed unfinished. The author, Richard Morais, was an editor at Forbes, but he doesn't seem to realize that just because you can write and you know about food and travel doesn't mean you can write a good novel about food. One of my goals for 2011 is to significantly reduce the amount of owned-but-unread books that I have piled up. I was sorting through the bookshelves the other day and I counted 168 175! And of course, this does not include any of the books I'm hoping to receive for Christmas . . . or use any Christmas money or gift cards to acquire. And of course this means I have to have every single one of my unread library books finished before January 1. All of them. No exceptions! What's really sad is that I've been schlepping a stack of these from house to house for years. Just for fun, I decided to sort them into piles based on how long ago I'd acquired them. This wasn't as hard as you'd think -- since I've moved six times in the past 15 years, I just had to remember where I was living when I'd gotten each book. It's pretty sad -- I have about 20 books I've owned for almost 10 years, some of them even longer. If I haven't read them by the end of the year, I'm donating them to the Friends of the Library sale. Period. So I've decided to make this my project for 2011: to read as many of these owned-but-unread books as possible. 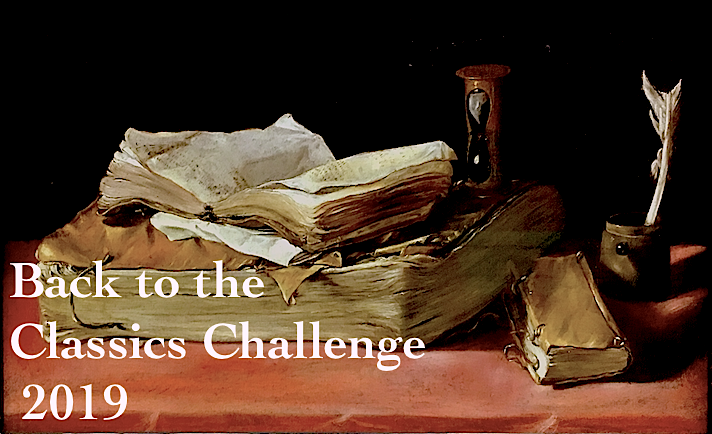 I'm not signing up for any challenges, though I did sign up for the TBR Dare, which will help me achieve this goal. With more than 150 books on my TBR shelves, I'd have plenty to read if I didn't acquire a single new book for the entire year, either through purchase or library loot. But realisticallyI know there's no way this is going to happen -- between my three face-to-face book groups, plus volunteering at my library branch twice a week, I can't swear not to read anything that's not on the TBR pile. I don't have to finish every single book; if I read at least 75 pages and I'm still not interested, I can give it away. Now, if something miraculous happens, and I actually get a library job, I'm allowed to start reading additional books if they are work-related. The library is theoretically hiring librarians next year, so I can only hope. For those of you who are curious, I am compiling a list of all my owned-but-unread books and will post it as a page with a tab at the top of my blog when it's complete. It'll take a while. I'm going to try and tackle the oldest books first. Here's the list of the books I've owned longest. Any recommendations from the list would be greatly appreciated -- and that includes recommendations to give them away. So, book bloggers, which should be read first? Which should be donated to the library sale? And, confess, how long have some of your books been hanging around on the to-read shelves unread? And which ones? Until I became a devoted Persephone reader, I had no idea that Burnett, like many children's writers, wrote tons of stuff for adults as well. All I knew of her was that she'd written The Secret Garden and A Little Princess, one of my childhood favorites. Also Little Lord Fauntleroy, but I've never had any desire to read it -- I guess it's that image of the little boys with short pants and long curly hair. I'm sure it was fashionable back then but now it just seems cruel. I also did not realize that although Burnett was English, she moved to the U.S. (to Tennessee, interestingly) when she was sixteen, after the death of her father. She was also quite poor at times and helped support herself and her family with her writing. She spent much of her adult life here as well, and eventually became a U. S. citizen. Burnett was married and divorced twice and had two sons, one of whom died young of TB. Anyway, this one of Persephone's more popular books and one the ten classics readily available here in the U. S. -- I actually bought it right off the shelf in my local chain bookstore! I didn't even have to order it online. It's actually two stories in one volume about the same character, Emily Fox-Seton. The first story is the original Making of a Marchioness, and the second is basically a sequel. So, it starts out with Emily, in her mid-thirties, living in London in genteel poverty. She's from a good family that have come down in the world, and of course she has no close family, so she is making ends meet by helping out as a sort of elevated domestic -- she runs errands for people, shops for them, writes letters, etc. She has been taken under the wing of an elderly rich lady Lady Maria, with a fancy country house. Lady Maria invites Emily out to her country house and asks for her help with her annual summer party -- basically, she gets Emily to do all the work for her without pay. It gets interesting, however, because the widowed Marquis of Walderhurst is also a guest, as well as two young unmarried debutantes on the prowl for husbands. The Marquis, though in his 50s, is quite the catch, and everyone expects to see him married off to one or the other of these women by the end of the season. But that would be too easy, wouldn't it? This is described as a charming Cinderella story, and apparently has been taught in colleges alongside Pride and Prejudice. The title alone should give the reader a hint of the outcome, so, hopefully, I haven't spoiled it for everyone. The first half is quite a nice little romance, but I found the second half of the book more surprising. It's much closer to a Victorian sensation novel, which I didn't expect at all! There's trouble in paradise after the heir apparent to the Marquise gets wind of the second marriage -- since Emily is fairly young and of childbearing age, his inheritance is in jeopardy. The heir is Captain Alec Osborn, and he is a real piece of work. A cad! A bounder! A ne'er-do-well! A slimeball! (Feel free to insert your own evil adjective here -- it's like book blogger Mad Libs). He's a slacker officer posted to India, and when he hears about Walderhurst's marriage, he hotfoots it back to England with his Anglo-Indian wife Hester, to see what they can do about it to protect their own interests. And this is where the story really changes. Instead of a sweet romance, our heroine (whom the author herself referred to as rather stupid and a sheepdog!) is in trouble, though it takes a while for her to realize it. I really don't want to give the ending away, but even though Emily was unbelievably sweet and naive, I became fond of her and I was quite worried about how it would all end. And the ending really surprised me. (Not like aliens or vampires suddenly appearing would have surprised me, but nevertheless a surprise ending). This book starts out as a sweet, fairytale like romance and ends up as a pretty serious commentary on the state of Victorian marriages, which I did not expect. Apparently her own failed marriages strongly influenced her writing. Another of Burnett's adult fiction books, The Shuttle, is also available through Persephone, I'm definitely interested in reading this and I may actually even read Little Lord Fauntleroy as well, just to see what it's like. 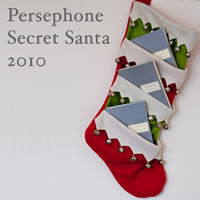 Sorry for the double posting today, but I can't wait until tomorrow to reveal my Persephone Secret Santa! (Trollope fans, please proceed to the posting below for my review of Barchester Towers). Well, my gift hasn't technically arrived, but thanks to all the wonderful clues (and a little help from a blogging friend!) I have finally figured out my Secret Santa: Care from Care's Online Book Club! She sent three wonderful clues to my gift, which was such fun. Even though the package hasn't arrived yet, they totally brightened my day and made me feel special. It was fantastic. And I'll be copying her next year, so, Persephone readers, you'll be getting clues if you're my Santee! Her clues were so clever -- I knew she was from Massachusetts, collected lobsters, and loved dogs -- she even made her own stamps with photos of her cute Wirehaired Pointing Griffons -- adorable. And unless I'm wrong, I'll soon be receiving a copy of They Knew Mr. Knight by Dorothy Whipple!! Woo hoo! I haven't read any Whipples yet and I've heard so many great things about them. Can't wait to read it. I also had fun choosing a gift for my Santee -- Marie from Boston Bibliophile! She received a copy of Reuben Sachs by Amy Levy, another book I've added to my to-read list. I look forward to reading her blog to see how she likes it. Finally -- thanks to everyone who commented on my post about Greenery Street by Denis Mackail. The lucky winner of my extra copy is . . . Jeanne from Necromancy Never Pays!! Jeanne, send me an email with your address so I can send you another Christmas present! Congratulations and I hope you enjoy it! Many thanks again to Claire at Paperback Reader for organizing the Secret Santa Swap. Two whole weeks of Anthony Trollope! It's my turn for a review of Barchester Towers, the second book in his Barsetshire Chronicles and one of his more popular books. 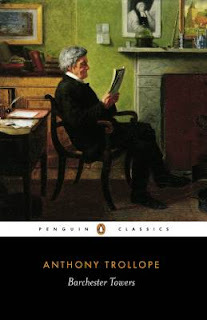 Anyway, I've been wanting to revisit Trollope for awhile. Last year I read The Warden, the first of the series set in fictional Barsetshire. 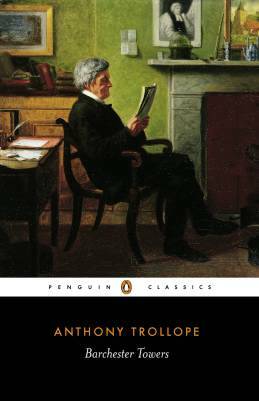 It's one of Trollope's shortest novels at only about 250 pages, but I didn't like it nearly as much as The Way We Live Now -- it seemed to take forever to get going. Barchester Towers gets interesting much more quickly. It picks up not long after the end of The Warden. If you haven't read The Warden, you may want to skip to the end as there are mild spoilers (it is a series after all). Anyway, the Bishop of Barchester is on his deathbed. Dr. Grantly, his son, who is also his archdeacon, is widely expected to pick up the reins and be appointed to his father's position, but that would be too convenient. A Dr. Proudie from London has been appointed instead. However, Dr. Proudie has no intention of actually spending that much time in the country -- he'd rather stay in London and make appearances in the House of Lords, so most of the responsibility will be shouldered by Mr. Obadiah Slope, his chaplain. This appointment throws the whole social and religious society in Barchester into a bit of an uproar because Dr. Proudie and Mr. Slope are more evangelical, also known as Low Church -- Trollope was making a statement about the schism in church politics. There was a dead pause in the room. Mr. Slope had risen from his chair, and was standing with his hand on the back of it, looking at first very solemn and now very black. Mrs. Proudie was standing as she had first placed herself, at the end of the table, and as she interrogated her foe she struck her hand upon it with almost more than feminine vigour. The bishop was sitting in his easy chair twiddling his thumbs, turning his eyes now to his wife, and now to his chaplain, as each took up the cudgels. How comfortable it would be if they could fight it out between them without the necessity of any interference on his part; fight it out so that one should kill the other utterly, as far as diocesan life was concerned, so that he, the bishop might know clearly by whom it behoved him to be led. There would be the comfort of quiet in either case; but if the bishop had a wish as to which might prove the victor, that wish was certainly not antagonistic to Mr. Slope. There are lots of misunderstandings, power struggles, and people falling in and out of love. Much of the action comes to a head at a hilarious garden fete hosted by the local gentry. Parts of this book really reminded me of Elizabeth Gaskell (I could absolutely envision the garden party after my repeated viewings of Cranford and Wives and Daughters) and the domestic scenes reminded me quite a lot of Jane Austen, particularly her sly wit. I've heard that Trollope was a huge Austen fan, which doesn't surprise me after reading this book. The book does start out a bit slow, though it picked up and became a faster read by far than The Warden -- I think I read about 150 pages this past Monday, which for me is amazing for a Victorian. I know Carolyn at A Few of My Favourite Books read 300 pages of Trollope a day for this circuit -- wow! The only other comment I'd like to make is that I really wish I had researched the Church of England before I'd started this book -- I wasn't raised Episcopal so I didn't really understand the difference between High Church and Low Church and all the different titles with the hierarchy of the various characters' positions. I wish I'd found some kind of chart to make it less confusing, like a family tree. I still enjoyed the heck out of this book but I think I might have gotten more out of it if I'd known more about the history. Of course I didn't read the introduction to this book first because I was afraid of spoilers. The endnotes were good but I think they assumed the reader knew more background. This was one of my favorite books of the year and I'm eager to read more Trollope. 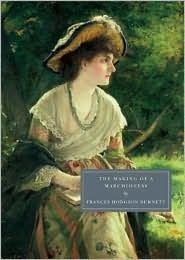 One of my goals for 2011 is to finish the Barsetshire series -- I've heard great things about both of the next two books, Dr. Thorne and Framley Parsonage. And today I was at Half Price Books with Amanda from The Zen Leaf, where I was delighted to find another volume of Trollope that includes Barchester Towers, Miss MacKenzie, and Cousin Henry -- for $3.22 which included tax! Sweet! 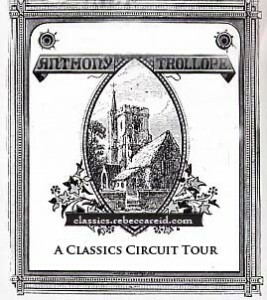 If you'd like to read more reviews of Trollope's novels and stories, please visit The Classics Circuit for links and more information. Greenery Street by Denis Mackail - plus a giveaway! 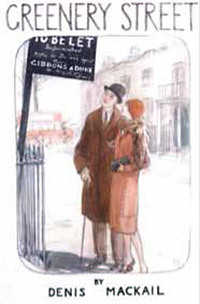 Greenery Street is the story of Ian and Felicity Foster as they begin their life together as young marrieds in London, 1925. Greenery Street (an actual street in Chelsea) is the perfect place, full of young couples -- once the families start growing, there just isn't enough room with babies and prams and nurses, so the young families tend to move on. The book starts out with a their courtship and the beginnings of their married life, as they look for a house, struggle with budgets, and deal with quirky neighbors and difficult servants (something I can't even imagine). This book is pretty lighthearted, definitely middlebrow fiction. What I particularly liked is the omniscient narrator who throws his two cents in every so often -- I know I read a review in which it was compared to the narration in Arrested Development, one of my favorite TV shows (and if that reviewer reads this, please let me know so I can give you credit). According to the Persephone website, "Greenery Street can be read on two levels - it is a touching description of a young couple's first year together in London, but it is also a homage - something rare in fiction - to happy married life." It starts out a charming, amusing book about a young couple, rather lightweight, with a little satire thrown in. However, by the end of the book, it's much more than that. In particular, the ending throws the reader a bit of a curveball, when Felicity and Ian are suddenly thrown in the midst of a fairly serious situation. I don't want to give anything away, but the ending of the book does leaves the reader with something to think about, a moral dilemma that I wasn't expecting at all. 1. Which is your favorite Persephone, and why? 3. Any recommendations for other books by Persephone authors you've read, or any other book you think would go well in their catalog? (i.e., books they should publish someday). Please be sure and leave some method of contact, either your email address or a link to your blog where I can contact you. Also, I'm going to have to limit the giveaway to the U. S. Copies of the dove-grey Persephones are tough to come by on this side of the pond, so I want to convert some readers here. I'll keep the giveaway open until midnight December 14 (Central Standard Time). I'll select my favorite comment for the winner, and post the name on December 15, the day when the Persephone Secret Santa participants will be blogging about their gifts. I first encountered this book at BookPeople in Austin, Texas (probably the world's best independent bookstore). One of the coolest things about this store is that it has an entire section just for classics. Joy of joys! Well, whilst browsing several months ago, I came across this volume shelved next to (gasp!) books by Charles Dickens. Who was this upstart Dickens, with her book on the shelf next to my beloved Bleak House and Oliver Twist? Who had the nerve to call herself Dickens??? Um, actually, his great-granddaughter, that's who. And a darn good writer in her own right, though nothing like the wordy, flowery prose of the beloved (and sometimes reviled) Charles. After purchasing it, I soon realized it was the second book from the marvelous Persephone imprint -- I already owned Miss Pettigrew Lives for a Day, which was waiting patiently on my to-read shelf. Sadly, Mariana languished on the shelves for several months until a few weeks ago when I needed something comforting during a nasty ear infection. And it was an excellent comfort read, but despite the beautiful cover, this isn't the chick lit I was expecting. The story begins with a young woman, Mary, who is alone in a country cottage during World War II. She's just heard on the wireless that a British ship has been sunk -- the ship on which her beloved husband is sailing. She is in a state of complete panic because there's a terrible storm and all the phone lines are down, and she can't even walk into the village to try and contact anyone. She is utterly alone in her terror and misery, with no company but a little dog until the following morning. The book then begins to flash back to Mary's childhood. She's never known her father, who died in the Great War, but she spends idyllic summer's at the family home in the country, surrounded by her loving grandparents, aunt, uncles, and cousins. She has an incredible crush on her cousin Denys, her first great love. The book then follows Mary through her childhood, adolescence, and life as a young woman growing up in London with her mother, a dressmaker, and her hilarious uncle Gerald, a somewhat ne'er-do-well actor. Mary struggles in school, flunks out of drama college, and learns dressmaking in Paris. We also follow Mary's love life -- the prologue never gives the husband's name, so I breathlessly followed the story to figure out which of her men could be lost at sea. This is a really nice coming-of-age-story set during the inter-war years, one of my very favorite periods. It's touching and sometimes absolutely hilarious -- Mary gets into some really amusing scrapes. Her time at drama school is particularly funny. 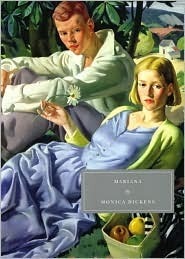 This book is loosely based on Monica Dickens' life, and what I also find very interesting is that Mariana was first published in 1940 when she was only 24! She never set out to become a writer, but sort of fell into it -- her first published work is One Pair of Hands, which is the story of her life working as a domestic (after she'd been a debutante!). I was so intrigued by this, having worked as both a professional pastry cook and a writer, that I instantly requested One Pair of Hands from my library. (Review to follow soon). For all you Persphone fans, and for those who are just intrigued, please do yourself a favor and find this book. It's one of the Persephone Classics that are readily available here in the US, so if you can't find it in your local bookstore, it's easy to find online. It's been so long that I actually wrote a book review that I'm afraid I've forgotten how. Between school, and traveling, and illness, I'm way behind in my reviews. Let's hope this review ends my blogging slump. Nevertheless, here's an interesting historical fiction book that I recently read while on vacation. I specifically brought it because I'm trying so hard to read more of the books I own, not just library books. One of my goals has been to clear of those to-read shelves, which are becoming more and more crowded. Must. Stop. Buying. More. Books!!!! Anyhoo. The Wives of Henry Oades starts out as a pretty straightforward historical fiction book. The story begins in England in the late 1800s, and Henry Oades has been given a promotion in his job, one which will involve him uprooting his wife and children and moving to wild New Zealand, much to the chagrin of his wife Margaret. Still, like a good Victorian wife, Margaret bears the difficulty of the long voyage, seasickness, etc., and makes a good start of a new life in a tough situation. Then something bad happens. I don't want to spoil this, but it's pretty awful. And again, not trying to spoil [the title of this book is The Wives of Henry Oades, isn't it?] 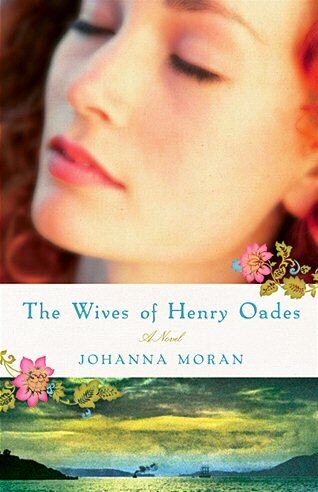 but due to terrible circumstances, poor Henry believes his wife is dead. After much grieving, he moves on, going to far as to leave New Zealand to make a new start as a farmer in California. Henry meets a young widow with a baby, and takes a liking to her. They marry. And that's when things get really interesting. . . highlight for the little hint. . . the first wife shows up, very much alive! What would you do? 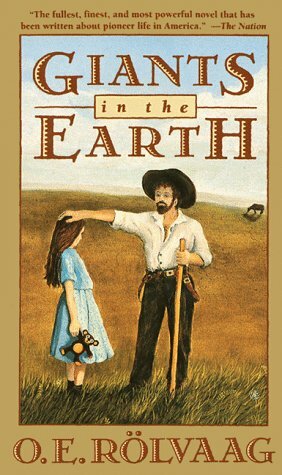 This book brings up all kinds of moral and ethical dilemmas, and what made it even more interesting to me was this is based on an actual family! I do get really tired of writers lifting plots and characters from real life, but this is so intriguing I absolutely understand why the author was compelled to fictionalize it. I really wish my library had enough copies so I could suggest it as a book for our discussion group. My only complaint is that I wish there had been more back story on some of the characters -- I would have liked a little more character development for some of the family members as well. But overall I really enjoyed it. And many thanks to Suey, since I won this book in her giveaway last spring. Amazingly, the publisher somehow sent me TWO copies of this book, so I was able to give one to my mother, who really liked it. She was very happy to receive it as she's actually been to New Zealand. It's so fun to give someone a book that they really enjoy. Thank you Suey! I only signed up for one Secret Santa swap this year, and when I heard Paperback Reader was organizing a swap for Persephone books, I jumped on it. I've already purchased a gift for my Santee and I'm hoping to send it out tomorrow with some homemade cookies. And I have received TWO clues from my Santa! When I got the holiday mail on Monday, I had my first clue -- a photocopy of one of the beautifully colored endpapers. I was able to identify the book from my 2011 Persephone Ninety Calendar, which includes all 90 of the beautiful endpapers. However, my Santa could be trying to trick me -- the author of that particular book, Dorothy Whipple, wrote six different books in the Persephone Catalog. Could Santa be leading me astray? Well, I haven't read any of them, so I'll be happy no matter what. I got my second clue in the mail today, and it is even more cryptic, full of clues as to the sender's identity. I am completely mystified! I know he or she lives in Massachusetts and has been blogging since 2007, and was able to attend the Book Blogger Con in NYC this year -- lucky!! Santa is also hosting a challenge which is about to end, and collects either lobsters, stamps, or dogs (a clue from the notecard I received). Anyway, I just wanted Santa to know that I'm loving this little mystery. Thanks again!! I only hope my Santee likes his/her gift as much as I will.